Endeavour Press, who publish an innovative range of ebooks, have recently accepted The I.T. Girl by Fiona Pearse for publication. Writer Fiona wasn't ready to self-publish, so after helpful advice from the SilverWood team she first used SilverWood’s initial editorial appraisal, then came back for a full copy-edit. She found the comprehensive feedback and detailed report and recommendations that she received extremely helpful as she worked on her final draft. Fiona subsequently received increased interest from the mainstream publishing industry when she submitted her manuscript for publication. She was thrilled and, after signing with Endeavour Press, wanted to share her good news with the SilverWood audience. Hi, Fiona, congratulations! Can you tell us how your writing career developed? I took a writing course just out of curiosity some years ago and to my surprise, loved it. But I drifted away from writing afterwards, busy with other things, until the idea for The I.T. Girl came along. I realised I was sitting on an opportunity to write something original since we rarely hear about the I.T. world, especially through the eyes of a woman. So, then I got the bug and along the way discovered a love of poetry. Some of my poems are published now and I hope to produce a book of poems some day. What made you approach SilverWood and how did they help you? After many submissions I finally received some rejections with the feedback "it's not quite there yet". So I thought the manuscript needed polishing but even a year after finishing it I still couldn't get that fresh perspective! Helen Hart had given a talk to my writers’ group and I felt SilverWood stood out from other self-publishing companies, offering support and a working knowledge of the industry. I received advice and guidance along with the copy-edit service and it was a real learning experience. What difference do you feel the editing made to your approach with publishers? It made a marked difference. After completing the edited draft, a number of publishers asked to see the whole manuscript based on a chapter submission so I felt I was on the right track then. I suspect that Endeavour Press who published The I.T. Girl would not have accepted it pre-edit because they only take completed manuscripts. It seems to be the way these days - publishers have less time to edit, they want something ready to go. What plans do you have for promoting The I.T. Girl? I don't have any elaborate plans but I will be approaching book reviewers and I regularly tweet about the story. I also blog and occasionally get a new poem published so these things attract attention to my website which in turn brings a few clicks to The I.T. Girl. I'd like to guest blog more. I have blogged for Lady Geek - an agency that promotes women in I.T. An interview with SilverWood is also a good start! How has having an existing presence online helped your career? I have made friends online through reading and commenting on each other's blogs and some of those friends have bought The I.T. Girl which is great. I've also made connections through poetry, but I think to create the kind of presence that would make a real difference you have to put a lot more time into it. I'm working on that. 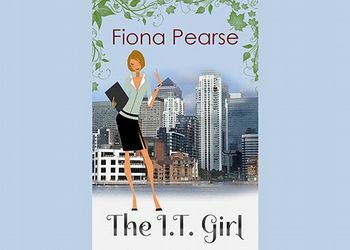 Have you got a follow up to The I.T. Girl planned? I have a plot in mind: a story about 2 female flatmates in London who make a deal. One needs a favour from the other and she has to give up something in return. That's all I'll say. But I write on the weekends and The I.T. Girl took me 3 years, so this could be another slow burn! Thanks, Fiona, and good luck with The I.T. Girl!